The two men were taking part in a public “dialogue” at Oxford University at the end of a week which has seen bitter debate about the role of religion in public life in Britain. Last week Baroness Warsi, the Tory party chairman, warned of a tide of “militant secularism” challenging the religious foundations of British society. The discussion, in Sir Christopher Wren’s Sheldonian Theatre, attracted attention from around the world. As well as being relayed to two other theatres, it was streamed live on the internet and promoted fierce debate on the Twitter social network. For an hour and 20 minutes the two men politely discussed "The nature of human beings and the question of their ultimate origin" touching on the meaning of consciousness, the evolution of human language – and Dr Williams’s beard. For much of the discussion the Archbishop sat quietly listening to Prof Dawkins’s explanations of human evolution. At one point he told the professor that he was “inspired” by “elegance” of the professor’s explanation for the origins of life – and agreed with much of it. 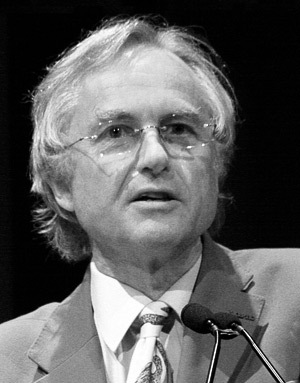 Prof Dawkins said that he was “6.9 out of seven” sure of his beliefs. “I think the probability of a supernatural creator existing is very very low,” he added. He also said that he believed it was highly likely that there was life on other planets. At one point he discussion strayed onto the theoretical question of whether a traditional cut throat razor could be described as a more complicated thing than an electric shaver. During a wide-ranging discussion the Archbishop also said that he believed that human beings had evolved from non-human ancestors but were nevertheless “in the image of God”. “The writers of the Bible, inspired as I believe they were, they were nonetheless not inspired to do 21st Century physics,” he said.